The global market for needle-free drug delivery devices has been registering a remarkable rise over the last few years, thanks to the growing demand for painless delivery of medications across the world. Analysts estimate this market to remain expanding steadily at a CAGR of 9.90% from 2015 to 2023 and increase its opportunity from US$5.4 bn in 2014 to US$13 bn by the end of 2023. The rising need for preventive measures for needle-stick injuries is projected to stimulate the adoption of these devices significantly in the coming years. Apart from this, the growing incidence of dengue, hepatitis, and various chronic diseases, in which regular administration of medicines is required, is also expected to fuel the demand for these devices substantially over the next few years. 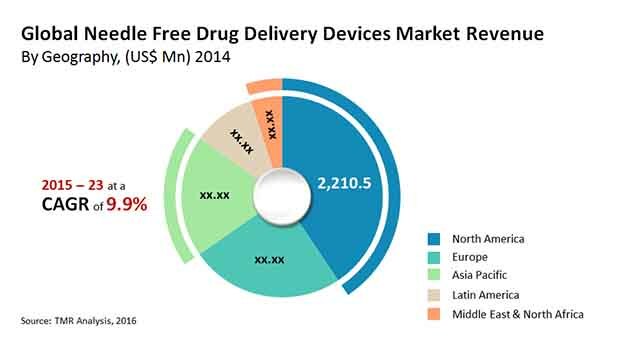 North America, Asia Pacific, Latin America, Europe, and the Middle East and Africa are the main regional markets for needle-free drug delivery devices across the world. North America and Europe dominated the overall market in 2014. While the market in North America was driven by a large pool of participants, the huge base of the geriatric population, demanding convenient and painless drug delivery led the Europe market for needle-free drug delivery devices. Analysts predict North America to retain its dominance in the near future albeit with a diminished market share. Asia Pacific, on the flip side, is projected to emerge as the fastest rising regional market for needle-free drug delivery devices in the coming years. The growing prevalence of chronic cardiovascular and neurological diseases, the infrastructural development in the medical and healthcare industry, and the increasing focus of leading players in this region due to unmet medical need are expected to boost the adoption of these devices in Asia Pacific considerably in the near future. These devices are also anticipated to experience a healthy rise in their demand in Latin America and the Middle East and Africa on account of the betterment of the healthcare scenario in these regions over the next few years. Needle-free drug delivery devices are mostly applied in insulin delivery, vaccine delivery, pediatric injections, and pain management. In 2014, the demand for these devices was the highest from the insulin delivery segment, which is likely to remain the same over the next few years. Other segments are also projected to register a steady rise in the demand for these devices in the nearing future. The competitive landscape in the worldwide needle-free drug devices market demonstrate a consolidated structure. Leading players are increasingly entering into mergers, acquisitions, and strategic partnerships to expand their reach in this market. They are also focusing aggressively on the introduction of innovative as well as advanced devices in this market to strengthen their position. Some of the leading manufacturers of these devices across the world are Injex Pharma AG, Antares Pharma Inc., Zogenix Inc., Pharmajet Inc., Glide Pharmaceutical Technologies Ltd., and 3M. This report on the needle free drug delivery devices market analyzes the current and future scenario of the global market. Large number of chronic pain and diabetes sufferers is increasing the usage of needle free drug delivery devices. Less pain and consistency in drug delivery are the major drivers of the global needle free drug delivery devices market. The needle free drug delivery devices market report comprises an elaborate executive summary, which includes a market snapshot that provides information about various segments of the market. It also provides information and data analysis of the global market with respect to the segments based on application and geography. A detailed qualitative analysis of drivers and restraints of the market and opportunities has been provided in the market overview section. In addition, the section comprises Porters Five Forces Analysis to understand the competitive landscape in the market. This section of the report also provides market attractiveness analysis, by geography and market share analysis by key players, thus presenting a thorough analysis of the overall competitive scenario in the global needle free drug delivery devices market. Based on technology, the market has been segmented into jet injectors and competing needle-free technologies. The competing needle-free technologies segment has been further divided into novel needle technology, inhaler technology, and transdermal patch technology. Novel needle technology includes micro-needle and pen needle. The market segments have been analyzed based on available approved products, cost-effectiveness, and preference for technologies by physicians and patients. The market size and forecast for each of these segments have been provided for the period from 2013 to 2023, along with their respective CAGRs for the forecast period from 2015 to 2023, considering 2014 as the base year. Based on application, the needle free drug delivery devices market has been segmented into five major categories: vaccine delivery, pain management, insulin delivery, pediatric injections, and others. Other applications of needle free drug delivery devices include angina, hypertension, and other medical conditions. The market segments have been extensively analyzed based on prevalence of the diseases, available treatment, and geographical coverage. The market size and forecast in terms of US$ Mn for each segment have been provided for the period from 2013 to 2023. The report also provides the compound annual growth rate (CAGR %) for each market segment for the forecast period from 2015 to 2023, considering 2014 as the base year. Geographically, the global needle free drug delivery devices market has been categorized into five major regions and the key countries in the respective region: North America (the U.S., Canada), Europe (the U.K., Germany, and Rest of Europe), Asia Pacific (Japan, China, and Rest of Asia Pacific), Latin America (Brazil, Mexico, and Rest of Latin America) and Middle East & Africa (South Africa and Rest of Middle East & Africa). The market size and forecast for each of these regions and the mentioned countries have been provided for the period from 2013 to 2023, along with their respective CAGRs for the forecast period from 2015 to 2023, considering 2014 as the base year. The research study also covers the competitive scenario in these regions. The report also profiles major players in the global needle free drug delivery devices market based on various attributes such as company overview, financial overview, product portfolio, business strategies, and recent developments. Major players profiled in this report include Zogenix, Inc., 3M Health Care, Antares Pharma, Inc., Glide Pharmaceutical Technologies Ltd., Injex Pharma AG, and Pharmajet, Inc.